ISTANBUL (AP) — Every morning, Meripet wakes up to her nightmare: The Chinese government has turned four of her children into orphans, even though she and their father are alive. Meripet and her husband left the kids with their grandmother at home in China when they went to nurse Meripet’s sick father in Turkey. But after Chinese authorities started locking up thousands of their fellow ethnic Uighurs for alleged subversive crimes such as travel abroad, a visit became exile. Then, her mother-in-law was also taken prisoner, and Meripet learned from a friend that her 3- to 8-year-olds had been placed in a de facto orphanage in the Xinjiang region, under the care of the state that broke up her family. Meripet’s family is among tens of thousands swept up in President Xi Jinping’s campaign to subdue a sometimes restive region, including the internment of more than 1 million Uighurs and other Muslim minorities that has alarmed a United Nations panel and the U.S. government . Now there is evidence that the government is placing the children of detainees and exiles into dozens of orphanages across Xinjiang. The orphanages are the latest example of how China is systematically distancing young Muslims in Xinjiang from their families and culture, The Associated Press has found through interviews with 15 Muslims and a review of procurement documents. The government has been building thousands of so-called “bilingual” schools, where minority children are taught in Mandarin and penalized for speaking in their native tongues. Some of these are boarding schools, which Uighurs say can be mandatory for children and, in a Kazakh family’s case, start from the age of 5. China says the orphanages help disadvantaged children, and it denies the existence of internment camps for their parents. It prides itself on investing millions of yuan in education in Xinjiang to steer people out of poverty and away from terrorism. At a regular news briefing Thursday, Chinese foreign ministry spokesman Geng Shuang said the measures taken in Xinjiang were necessary for “stability, development, harmony” and to fight ethnic separatists. But Uighurs fear that these measures are essentially wiping out their ethnic identity, one child at a time. Experts say what China is doing echoes how white colonialists in the U.S., Canada and Australia treated indigenous children — policies that have left generations traumatized. For Meripet, the loss is agony; it is the absence of her children and the knowledge they are in state custody. A year and a half after leaving home, the 29-year-old mother looked at a photo of a brightly painted building surrounded by barbed wire where her children are believed to be held. She fell silent. And then she wept. When Xi came to power in 2012, an early challenge to his rule was a surge in violent attacks that killed several hundred people and which Beijing pinned on Uighur separatists. Since then, Xi has overseen the most extensive effort in recent years to quell Xinjiang, appointing in 2016 the former Tibet party boss Chen Quanguo to lead the troubled region bordering Afghanistan. Chen rolled out unprecedented security measures such as the internment camps that hold Muslims without trial and force them to renounce their faith and swear loyalty to the ruling Communist Party. China has described religious extremism as an illness that needs to be cured through what it calls “transformation through education.” Former detainees say one can be thrown into a camp for praying regularly, reading the Quran, going abroad or even speaking to someone overseas. The camps are among the most troubling aspects of Xi’s campaign to assert the party’s dominance over all aspects of Chinese life, which has drawn comparisons with Mao Zedong. Authorities heeding Xi’s call to “Sinicize” religion across the country have shut underground churches , burned Bibles , replaced pictures of Jesus with ones of Xi, and toppled crescents from mosques. The party also has beefed up its ability to track the movements of its 1.4 billion people, with Xinjiang serving as an important testing ground. In Xinjiang, detention has left countless children without their parents. Most of these families in China cannot be reached by journalists. However, the AP interviewed 14 Uighur families living in Turkey and one Kazakh man in Almaty with a total of 56 children who remain in China. The families say that among these children, 14 are known to be in state-run orphanages and boarding schools. The whereabouts of the rest are unknown because most of their adult relatives in Xinjiang have been detained. Some interviewees, like Meripet, requested that they be identified only by their first names because they feared official retaliation against their relatives. Others insisted their full names be used despite the risks, saying they were desperate for their stories to be heard. They pleaded with reporters to track down their families in Xinjiang, and one interviewee pressed a piece of paper into a reporter’s hand with a Chinese address scribbled on it. The regional government appears to be moving quickly to build centers to house the children of these exiles and of detainees. An AP review of procurement notices in Xinjiang has found that since the start of last year, the government has budgeted more than $30 million (200 million Chinese yuan) to build or expand at least 45 orphanages, known variously as children’s “welfare centers” and “protection centers,” with enough beds to house about 5,000 children. In July and August alone, the government invited bids for the construction of at least nine centers for the “protection of disadvantaged children” in the Xinjiang city of Hotan and several counties in Kashgar, Aksu and Kizilsu prefectures, inhabited primarily by ethnic minorities. Most orphanages have a minimum of 100 beds mandated by the government, and some are much larger. One notice called for an orphanage in Moyu county with four four-story dormitories, coming to 22,776 square meters in size — nearly as big as four football fields. These numbers do not include kindergartens and other schools where some children of Uighur detainees are being housed. It’s impossible to tell how many children of detainees end up at these schools because they also serve other children. Shi Yuqing, a Kashgar civil affairs official, told the AP over the phone that “authorities provide aid and support to everyone in need, whether they’re the children of convicted criminals or people killed in traffic accidents.” But such services may not be welcome. A government report from Bayingolin Mongol Autonomous Prefecture in June last year acknowledged that relatives were resistant to “handing over” their extended families’ kids to the orphanages because they “lack trust or confidence” in the centers. A friend told Meripet last November her four children were living in the Hotan City Kindness Kindergarten in southern Xinjiang. The friend said Meripet’s sister-in-law had visited her children and was permitted to take them home for one night only. The school looks like a house-sized castle, with a bright marigold facade, orange turrets and blue rooftops. Its entrance is blocked by an iron gate and a walled enclosure lined with barbed wire. “We Are Happy and Grateful to the Motherland,” say the red characters emblazoned on one fence. The principal, who gave only her last name, Ai, told AP reporters that the institution is “just a normal kindergarten.” But the authorities’ anxiety was clear: armed police officers surrounded the reporters’ car minutes after their arrival at the school and ordered them to delete any photos. “Soon after many of the kids arrived at the school, they grew taller and got fatter, and quickly started using Mandarin to communicate,” the article said. Another state media report in January said $1.24 million (8,482,200 yuan) had been invested in the kindergarten. “The children started educating their parents: your hands are too dirty, your clothes are too dirty, you haven’t brushed your teeth,” the report quoted Achilem Abduwayit, a deputy chief of the Hotan city education bureau, as saying. Life in an orphanage could have a lasting psychological and cultural impact on children, said James Leibold, an expert on Chinese ethnic policy at La Trobe University in Melbourne, Australia. Meripet has at least an inkling of where her children are. Her brother, a 37-year-old doctor named Aziz, has not heard any news of his three youngest children since his wife was taken to a re-education center in June 2017. Aziz fled to Turkey more than a year ago after he received a call from his local police station ordering him to report to authorities immediately. More than half his neighbors had already been taken away to re-education centers or prison, he said. Now the young doctor is often shaken awake by a nightmare in which his kids are huddling at the bottom of a cliff, their faces smudged with dirt, calling to him to hoist them up. Aziz walks for what feels like hours but cannot reach them. He awakens with their cries ringing in his ears. The government says all 2.9 million students attending compulsory elementary and junior high school in Xinjiang will receive Mandarin instruction by this month, up from just 39 percent in 2016. Even preschoolers are steeped in the language. A former teacher at a “bilingual” kindergarten outside Kashgar said all lessons were given in Mandarin and the entirely Uighur student body was banned from speaking Uighur at school. A colleague who used Uighur to explain concepts to students was fired, according to the teacher, who lives in Turkey but asked for anonymity because she fears retribution against family in China. Like all schools in China, this one immersed children in patriotic education. Kindergarten textbooks were filled with songs like “Without the Communist Party, There Would Be No New China,” the teacher said. 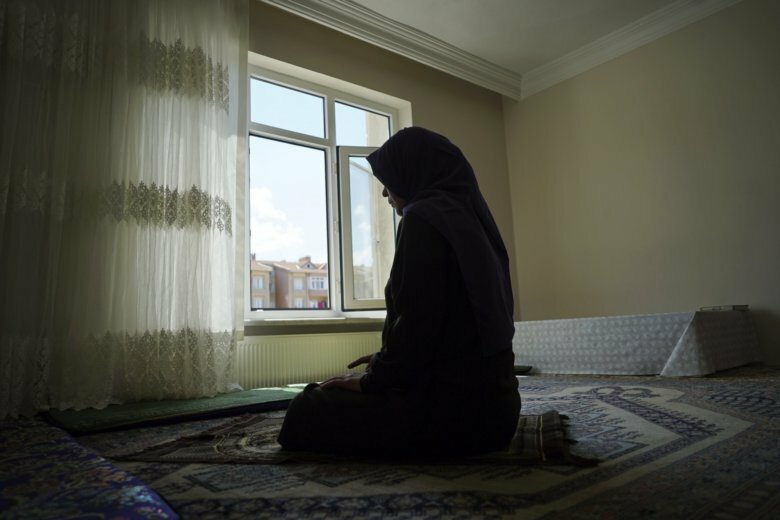 Dilnur, a 35-year-old business student in exile in Istanbul, said officials regularly visited her children’s kindergarten in Kashgar and asked the students if their parents read religious verses at home or participated in other faith-based activities. The questions effectively forced children to spy on their own families. A man was taken away by police after his grandson said in class that he had made a pilgrimage to Mecca, she said. Her seven-year-old daughter once complained that her throat was sore from chanting party slogans. “Mama, what does it mean to love the motherland?” she asked. Some bilingual schools are boarding schools, which are not uncommon in China. Xinjiang has long provided voluntary boarding school programs that are seen as coveted opportunities for the best minority students. But several Uighurs asserted that in many cases boarding school was now mandatory for minority children, even though Han Chinese children could choose to continue living at home. The Xinjiang government did not respond to repeated requests for comment. The government has said the tuition-free boarding schools relieve parents of education and living expenses and help raise Mandarin standards, which will make their children more employable. But Uighurs say they don’t want their culture erased. “If the kids are forced to speak Mandarin and live like Han Chinese every day, I’m afraid they won’t be like us anymore,” said Meriyem Yusup, whose extended family has four children sent to state-run orphanages in Xinjiang. Adil Dalelkhan, an ethnic Kazakh sock merchant in exile in Almaty, said that even though his then 5-year-old son could live with relatives, he was forced to stay at his preschool Mondays through Fridays instead. The father called the policy a “terrifying” step toward extinguishing Kazakh culture. A Uighur businessman in Istanbul, also named Adil, told a similar story. Adil’s son was 9 years old when the school system automatically transferred him to a boarding school. All children of a certain age in their Uighur district were obliged to attend boarding school, Adil said. His son was only permitted to come home on weekends and holidays. “There were iron bars like we saw in a zoo in Kashgar,” Adil recalled. Dilnur said her neighbors too were only allowed to visit their kids at boarding school on Wednesday nights, and even then they had to hand them candies through a fence. A government notice posted in February in Kashgar states that children in the fourth grade and above with parents in detention must be sent to boarding school immediately — even if one parent is still at home. Students must be instilled with socialist values, the notice said, and be taught to “be grateful for education and love and repay the motherland,” and avoid the “75 types of behavior that show religious extremism.” Such behavior ranges from calling for ‘holy war’ to growing beards and quitting smoking and drinking for religious reasons, the government says. China insists it guarantees the freedom of religion, but Uighurs view the Chinese education system as a threat to it. In schools, children are taught to respect teachers more than their parents and may criticize their parents’ Islamic faith, according to Byler. “The students, children, might question them and say, you know, this is backward, this is extremist,” he said. The Kashgar notice also said schools being modified to house students should place no more than 24 beds in one room–an indication of the program’s size. In 2015, a sprawling new boarding school complex was completed on the outskirts of Kashgar, with the capacity to house 23,400 students and teachers, according to the state-run China Daily. Abdurehim Imin, a writer from Kashgar, said a friend told him his 14-year-old daughter was sent to a bilingual school in 2015 after his wife was arrested, ostensibly for receiving a gift of olive oil he sent her. When AP reporters visited what was likely his daughter’s school, Peyzawat County No. 4 High School, a local plainclothes officer who identified herself as Gu Li said it was a bilingual boarding school. She said that while Uighur students had to study Mandarin, there were also Han Chinese students studying Uighur. Yet the exterior of the school bore bright red lettering that said: “Please speak Mandarin upon entering the schoolyard.” Barbed wire around the campus extended for miles, with rows of tall apartment buildings marked as dormitories. A historian at the University of Sydney, David Brophy, said the move toward boarding schools brings to mind Aboriginal children in Australia who were forcibly separated from their families in the 1900s and placed into state-run institutions that discouraged indigenous identity. “Should China’s policies continue in this direction, we may be talking about a Chinese version of the Stolen Generation,” he said. Since coming to Istanbul by himself in 2014, 42-year-old Imin, the writer, has led a solitary existence in a dimly-lit apartment with bare walls and stacks of writings. For the first year, he avoided looking at photos of his children. In December, he was sent a photo of his daughter wearing a traditional Chinese “qipao”. He deleted the picture because he could not bear to look at it, he said, and could not sleep for nearly a month. Imin also has four other children in Xinjiang. Last summer, a friend who had visited his home in Kashgar told Imin that two of his kids were killed in a traffic accident while his wife was in jail. He doesn’t know where the other two are. Elsewhere in Istanbul, Meripet’s house was quiet during Eid al-Adha, a Muslim holy festival heralded by large family reunions. In a room at the end of the hall, there rose the distant laughter of relatives’ children, children who were not hers. Associated Press journalists Gillian Wong in Beijing and Manuel Valdes in Seattle contributed to this report. Follow Yanan Wang and Dake Kang on Twitter at @yananw and @dakekang.